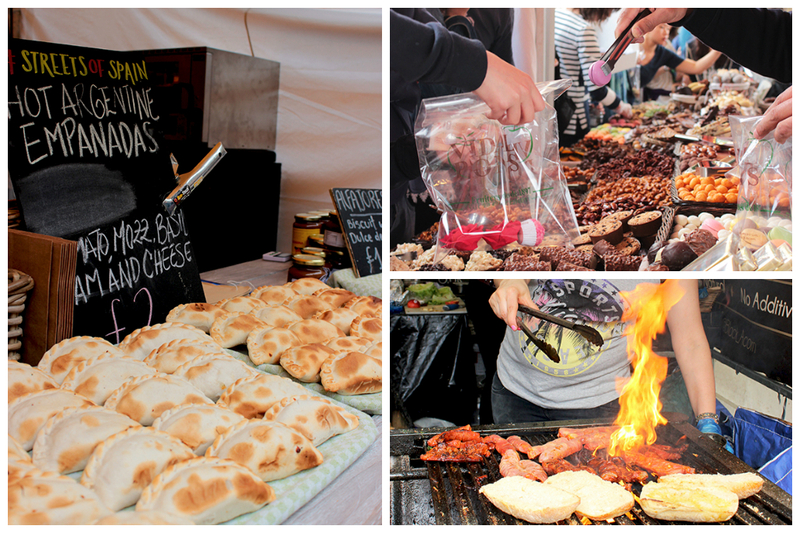 Streets of Spain is a special food festival hosted at the South Bank centre in London, a suggestive location just beside the famous London Eye. 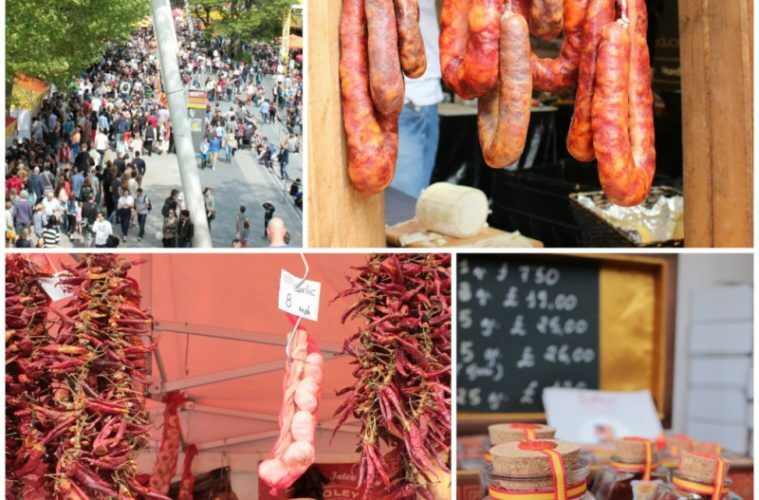 For only 4 days, the world famous “La Bocheria” – the food market settled in Las Ramblas, Barcelona main street- has moved in London, to sell authentic Spanish food, from chorizo to Iberico ham, not to mention patatas bravas and all sorts of tapas! Spanish wine brand, Campo Viejo was behind the four day event which celebrated the food, wine, art and culture of Spain. A truly amazing foodie experience. Incredibly huge Iberico hams were displayed at the stalls, where you could taste, buy and learn more about the whole process of curing this unique meat. Jamón ibérico (or Pata negra) is made by Iberian black pigs, which are on a very strict and healthy diet in order to reach the best quality jamón ibérico. The hams are then salted and left to begin drying for two weeks, after which they are rinsed and left to dry for another four to six weeks. 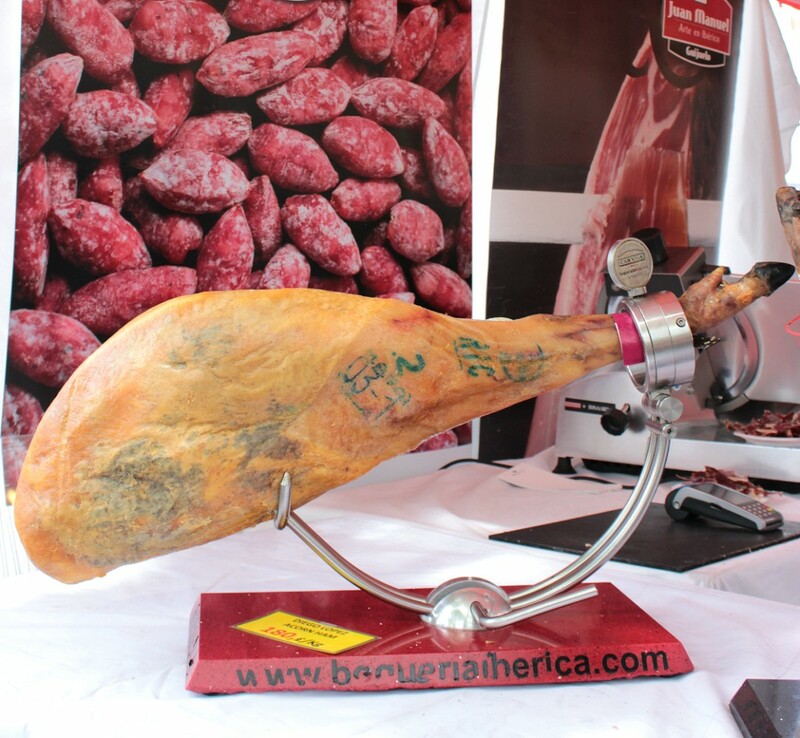 The curing process takes at least twelve months, although some producers cure their jamones ibéricos for up to 48 months. Moving forward, there was no chance (thankfully) to skip the Chorizo stalls, where tons of different kind of pork sausages from the Iberian Peninsula were offered to us lucky people. Spanish Chorizo is made from coarsely chopped pork and fat, seasoned with smoked paprika and salt. It is generally classed as either picante (spicy) or dulce (sweet), depending upon the type of smoked paprika used. This cured sausage is so versatile, can be served as a tapas, cooked with scrambled eggs for an energetic breakfast, or added as an ingredient to give a rich flavour to other dishes. 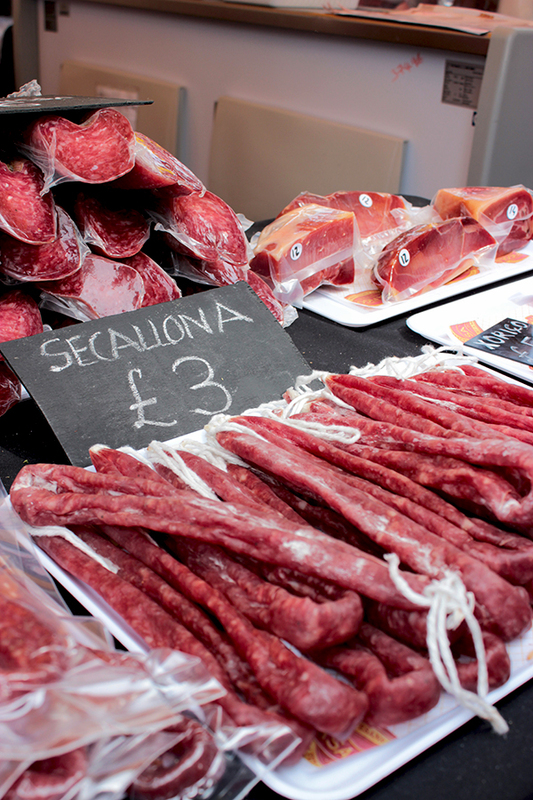 Longaniza (or Secallona) is a different kind of cured sausage, less popular but delicious. The only difference between Longaniza and Chorizo is that smoked paprika is replaced by black pepper, and some other spices can be added like nutmeg. 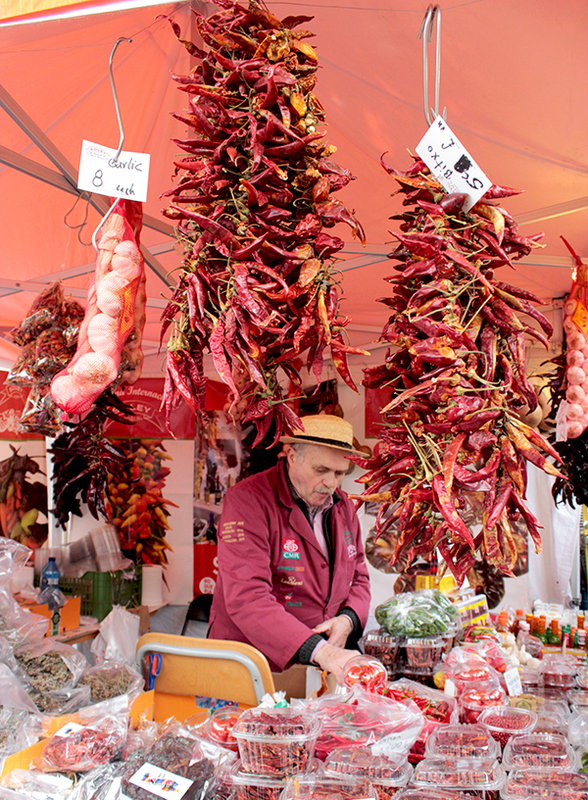 The Spanish hot peppers stalls were fascinating, and the producers would give you all the info’s about the history of each one. Spain has a wide range of hot chilli peppers, which can be confusing because their level of flavor or heat can often only be identified by tasting, by which stage you could be suffering from second degree burns to your mouth. Go for Jalapeño, Serrano and Cayenne for a mild flavor, don’t exaggerate with fresh Tabasco, and definitely be careful when using Habañero peppers. Delicious sweets, chocolate treats and popular Spanish products captured your eyes at every step, but the big focus was on all kind of tapas you could find around the area. Among the favorite tapas (you could easily tell by how long the queue was) were homemade Empanadas, all-you-can-fill tortillas, grilled fresh chorizo’s and longaniza’s, and spicy patatas bravas. 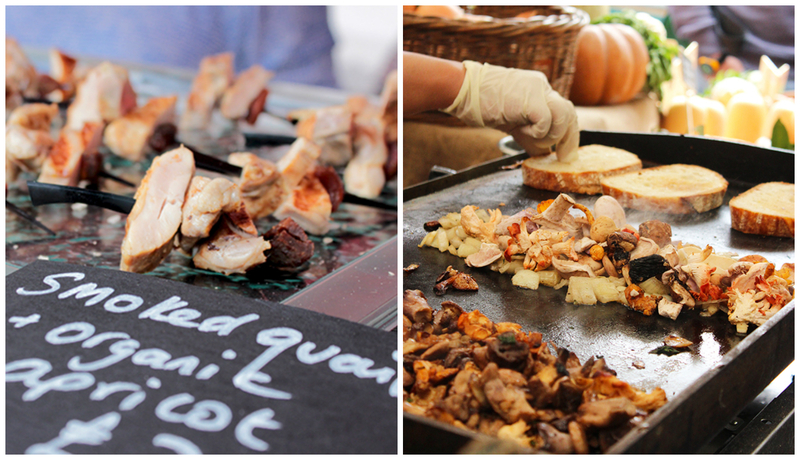 My all time favorite tapas were the wild mushrooms grilled toastes and the smocked quail with roasted apricot, two creative and tasty combo’s which really amazed me! Last but not least, tons of rice were cooked up to satisfy people ‘s Paella craving. Giant skillets contained the pure Spanish gold. 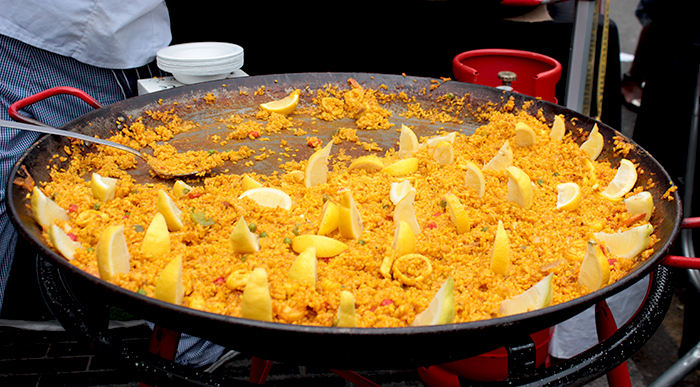 Paella is the most famous Spanish dish around the world. The popular version is made with short-grain rice, chicken, mixed seafood, vegetables and saffron ( which gives the unique color to the dish). Traditionally is cooked on open fire, fueled by orange and pine branches along with pine cones. This produces an aromatic smoke which infuses the paella. Guests are welcomed to eat from the paellera directly and fight for the last bite. 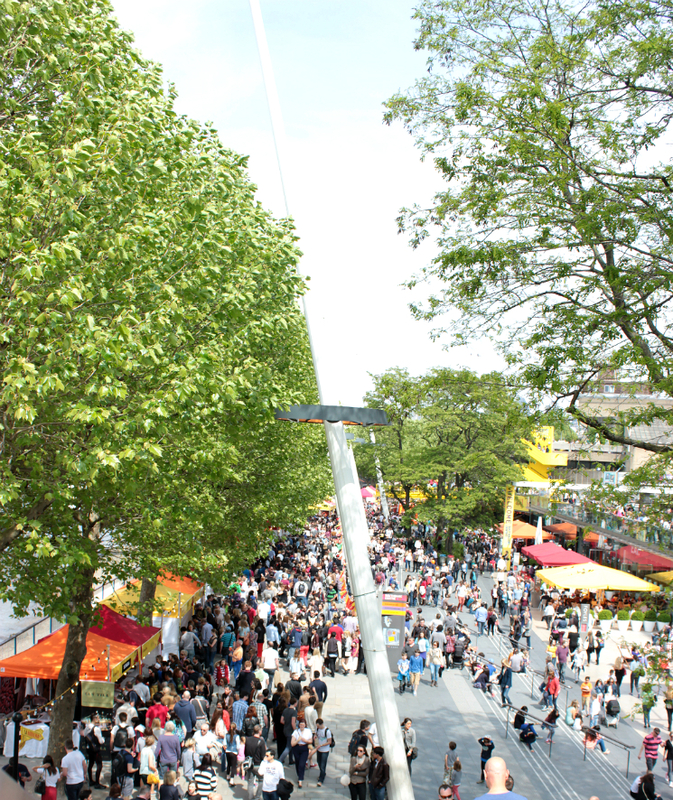 A tremendous amount of people got by the Thames to enjoy the past weekend Spanish food festival, and besides the food and wine there were also live performance, from street art to music artists. The famous singer The Passenger performed a fantastic and totally free surprise gig, making thousands of fans sing the popular Let her go song out loud. –Really, there should be more people like him. Now that you know what Streets of Spain is about, I recommend you book your tickets to London straight away, check the official website to know when the next festival will take place. I’ll certainly be there! How fun! I’ve been there for a Christmas market, but somehow missed going to this one! Good to know. thanks!!! it’s a great place, they do amazing festivals and market every week. Like heaven to me!